A new space in Marquette University's Opus College of Engineering is promoting active learning in an immersive 3D environment. 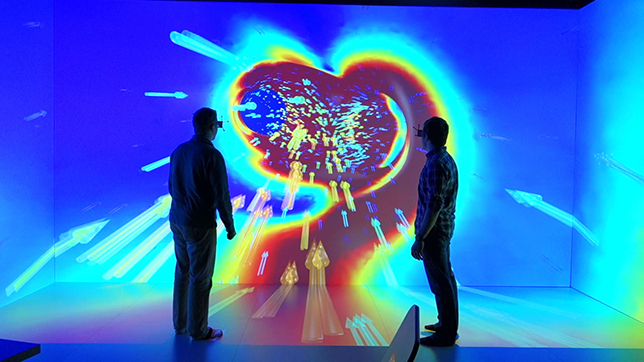 The university worked with Christie to build a Cave Automatic Virtual Environment (CAVE) dubbed the MARquette Visualization Lab, or MARVL. The multi-disciplinary campus resource is an 18-by-9-foot room illuminated by 10 Christie Mirage Series WU7K-M DLP projectors, using embedded Christie Twist for image blending and warping. There is enough space for 30 people to view 3D graphics in near-4K resolution on the front wall; the room can also be configured in "split mode," with two, three-sided CAVE environments. In developing MARVL, Marquette's top priorities were that the lab had to be capable of viewing volumetric data sets, offer real-time collaboration and be viewable by a large audience. The university researched visualization labs across the country and worked with the needs of internal users to achieve the end result. As project leader John LaDisa, director of the visualization lab and associate professor of biomedical engineering, recalled, "I was just a user looking for a unique angle and unique way of getting more from my data in computational fluid dynamics, but there's just so much that can be done and so many people who come and are excited about the different things they can do." For example, Marquette's Haggerty Museum of Art has used MARVL to recreate Salvador Dali's "Madonna of Port Lligat" as a 3D interactive painting, while students from Milwaukee Area Technical College's Animation program have used the facility to create a 3D exam room that allows undergraduate and graduate nursing students to practice in a simulated environment. "It has been amazing to watch [MARVL] go from a classroom, to seeing a group of industry personnel walking through it, then having a physician come over and look through an artery. We even have immersive fitness classes in here ... we have changed it into a sports and fitness studio," said LaDisa. "I think the thing that I'm most happy about is just how much it's being used across the campus and southeastern Wisconsin," he added. "We've been open roughly 450 days and we've had 2,000 people through our doors. We've delivered almost 800 student experiences including full, one-hour classes showing content that is applicable to the courses students are in. At last check, about three-quarters of all schools and colleges across campus have ongoing projects in the labs. It's been even more of a location for collaboration than we anticipated from initial interviews with faculty."